122 countries voted, last July, for the legal prohibition of nuclear weapons. Yet, the five official nuclear weapon states and their allies strongly oppose a nuclear ban. They argue that it might undermine the Nuclear Non-Proliferation Treaty (NPT). The NPT is, after all, the cornerstone of the global nuclear non-proliferation regime. With near universal membership, the NPT can be considered a success of global security governance. However, like all systems of norms, the regime has not been free from contestation; challenges to its normative structure have been a common feature. Yet, so far it has proven robust. Why this relative stability, and what about the future? Multilateral treaty regimes like the NPT present complex compromises among actors with multiple interests and worldviews. Therefore, the regimes incorporate structural fault lines deriving from the main differences of interests and ideas manifest already during the negotiations. These fault lines spark continued processes of contestation which keep normative dynamics within the regime alive. 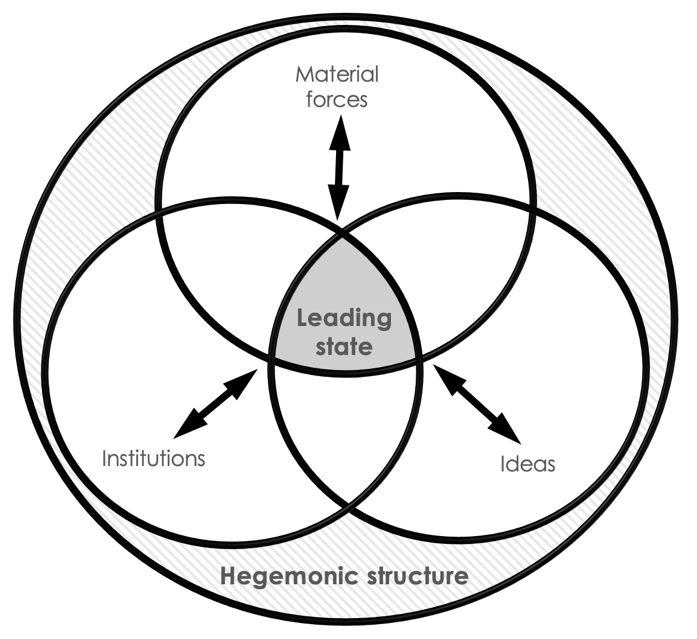 Norms are never carved in stone but subject to interpretation and change of meaning – triggered by intrinsic (non-compliance or internal disputes) as well as extrinsic events (technological developments or shocks like 9/11). Such disputes about normative meaning are the engine driving norm dynamics. They are instantiated by actors committed to preserve the status quo, to reform, or to revolutionize the regime. 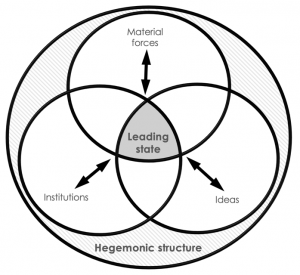 Whether contestation leads to normative progress, or blockage or even decay ultimately depends on three factors: commitment by the powerful parties to appreciate the concerns of the many, the work of bridge-builders for compromises, and the construction of reciprocal gains from compliance by all. 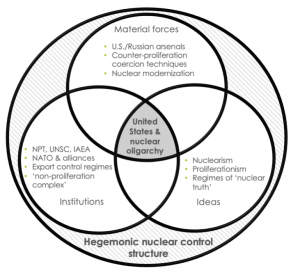 Many disputes within the NPT relate to its inherent inequality: it distinguishes between nuclear weapon states (NWS) and non-nuclear weapon states (NNWS) which bear different rights and duties. These differences create opposite perspectives on the NPT, the way it operates, and how to improve its functioning. From these perspectives, different ways to understand the regime norms, their relative weight and their interrelations result, all structured by conflicting justice claims. NWS justify their privileged status by their responsibilities for world order as permanent members of the UN Security Council: a status-related concept of justice. NNWS demand the elimination of the power difference which different NPT status implies: an equality-based concept of justice. 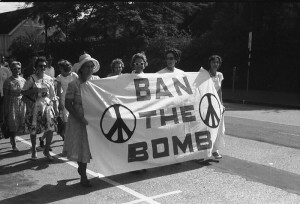 In addition, developing countries claim preferred access to civilian nuclear energy as compensation for the past wrongs of colonial exploitation: compensatory and need-related concepts of justice. 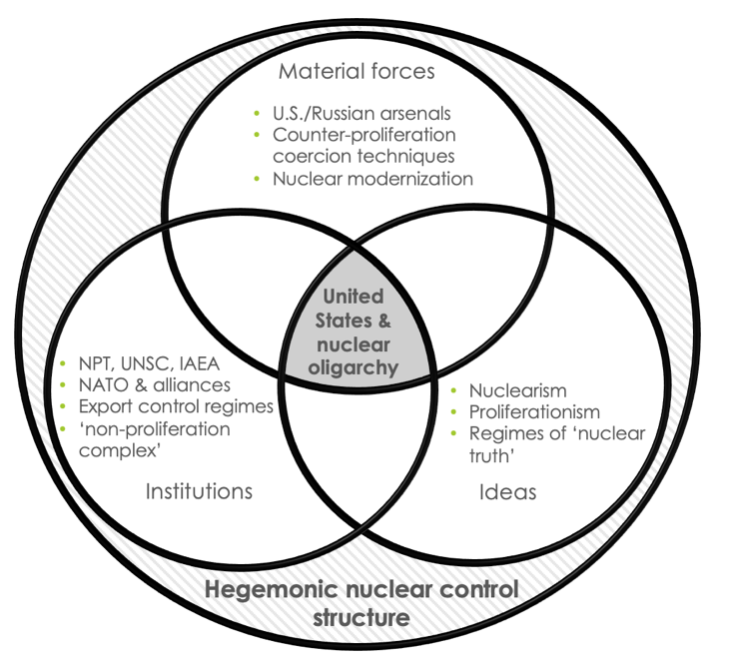 What is called the NPT’s three interrelated “pillars” – nonproliferation, peaceful uses, and disarmament – installed as result of a “bargain” between the different groups of states, constitutes the regime’s fault lines, from which key patterns of contestation derive: the disarmament and the peaceful uses/nonproliferation disputes. Additionally, contestation results from disagreement on the relative weight of the “pillars” (are disarmament and peaceful uses as weighty as non-proliferation or even weightier? ), the difference between states parties and non-NPT members, and procedural disputes. In all issue areas, contestation is related to the NPT’s inherent inequality. Contestation consequences vary: disputes have repeatedly led to incremental norm improvement by specifying prescriptions and proscriptions, sharpening the nonproliferation tools, and widening the NPT agenda. If accompanied by a spirit of understanding and compromise, positive norm dynamics emerge. But when norm contestation engenders an antagonistic feedback cycle that drives parties further apart, the regime community is shattered; blatant non-compliance might then meet insufficient response, parties turn to unilateralism and seek progress outside the procedures of the NPT. This may lead to norm erosion or even regime collapse. Such processes might arise when deeply emotionalized justice claims guide either side and make compromising difficult. The origins of the Humanitarian Initiative and the failure of the 2015 RevCon on the Middle East suggest that this is most likely when parties get frustrated by a series of broken promises: The CTBT is still not in force, the FMCT is not even being negotiated, and there is no progress on the Middle East. Disregard by the powerful for the majority’s complaints betrays a lack of respect and recognition that drives negative emotions. When such antagonistic contestation coalitions face each other over time, preventing all adaptation of the norm system to changing circumstances, the regime will look increasingly ineffective. Members may lose interest in membership. This stalemate motivates norm entrepreneurs (mostly of the “good citizen” type) willing to build bridges and to shape cross-cutting coalitions beyond the boundaries of the established groups, to explore and shape compromises. Their activities enhance the chances for consensus-building considerably. Eventually, the NPT inequality problem can only be solved through a credible disarmament process, reciprocated by improved nonproliferation measures. Without satisfactory offers of civilian assistance and cooperation to the Global South by the North, regime efficiency will remain limited. The prospect of win-win results mitigates regime inequality and induces cooperation. What does that tell us for the future of the NPT given the newly established nuclear ban treaty? 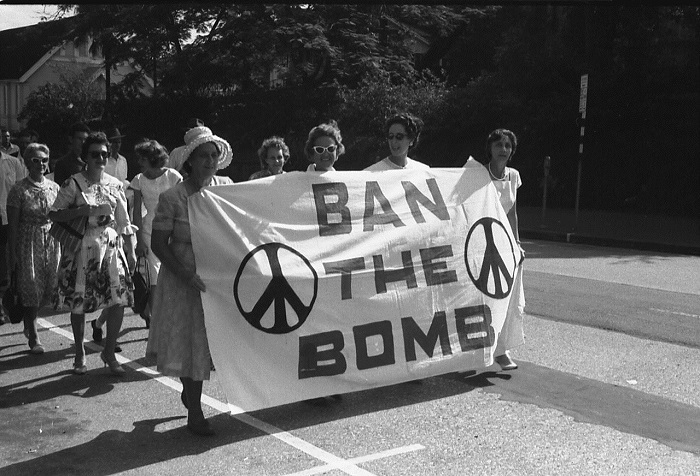 For one, the ban treaty should not be regarded as competing with but rather as complementary to the NPT. Sure, a stronger wording would have been desirable. Yet, the humanitarian initiative is a direct result of ongoing contestation processes within the NPT, which resulted in frustration and anger of many NNWS with the slow pace of disarmament within the NPT. 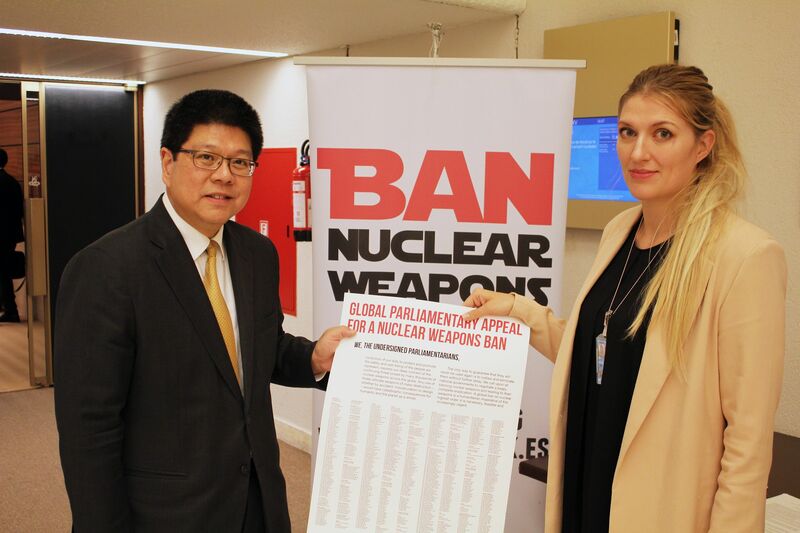 By moving the issue beyond the NPT, the protagonists of the humanitarian initiative and the promoters of the ban treaty took a last resort, regained recognition for their demands and exerted considerable normative pressure on the NWS (and their allies). Furthermore, many ban advocates have been actors with a long-standing commitment for the NPT. That they went beyond the NPT does not mean they want to destroy it. It could rather be assumed that they keep their long-standing commitment for the NPT. Carmen Wunderlich is a postdoctoral researcher at the Peace Research Institute Frankfurt (PRIF). Harald Müller was Executive Director of the Peace Research Institute Frankfurt (ret.) and is Prof. emeritus for International Relations and Peace Studies at Goethe University Frankfurt. They are authors of “Not lost in contestation: How norm entrepreneurs frame norm development in the nuclear nonproliferation regime”, Contemporary Security Policy, forthcoming. It is available here. The election of Donald Trump raises questions about nuclear cooperation with allies in Europe and Asia. Reducing the role and prominence of U.S. nuclear weapons in its alliances, however, would remove a major avenue for U.S. influence. The election of Donald Trump as the 45th President of the United States heralds a time of volatility, if not crisis, in U.S. alliances worldwide. Trump’s characterisation of America’s NATO allies, Japan, and South Korea as free riders on the military capabilities of the United States points to a more transactional approach to international relationships than we have been used to in the recent past. Burden-sharing has always been a sensitive issue for the United States and its allies. But what really caught the attention of observers during the election campaign was Trump’s solution to the alleged free riding of Japan and South Korea: If elected President, he would give the green light for Tokyo and Seoul to develop their own nuclear forces rather than them relying on the U.S. nuclear umbrella. This comes after several years in which both allies have sought increasingly detailed and firm understandings with the United States about the functioning of the nuclear umbrella in Northeast Asia. 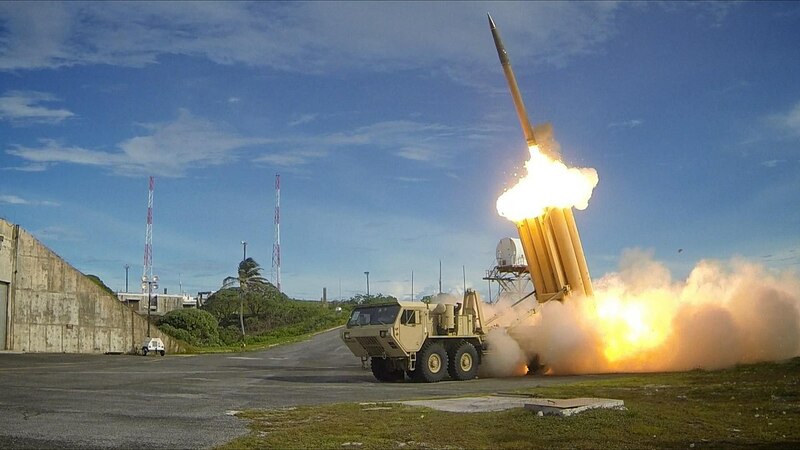 Reports that at this year’s U.S.-ROK ‘2+2’ meeting South Korean officials requested a semi-permanent presence of U.S. ‘strategic weapons’ on the Korean peninsula confirms a growing concern in Seoul that credible extended deterrence requires forward basing along the lines of NATO. The establishment in October 2016 of the US-ROK Deterrence Strategy Committee–which promotes greater interagency coordination between Seoul and Washington, DC–builds on initiatives taken shortly after the 2010 U.S. Nuclear Posture Review to institutionalise nuclear consultation in the U.S.-ROK and U.S.-Japan alliances. The Obama administration was receptive to demands from Tokyo and Seoul for greater reassurance regarding the nuclear umbrella in spite of the President’s landmark 2009 pledge in Prague to reenergise US nuclear disarmament efforts. But Washington, DC was sure to set clear limits on this consultation: Despite strong preferences in Seoul and Tokyo for the NATO model of the nuclear umbrella, American officials made it clear that consultation arrangements would not replicate detailed NATO nuclear policy planning. Nor would they involve the forward basing of nuclear weapons in Japan or South Korea, at least not yet. In NATO, notwithstanding the questioning by some ‘older’ European members of the continuing need for nuclear weapons, the Deterrence and Defense Posture Review (DDPR) of 2012 reaffirmed the Alliance’s commitment to the nuclear umbrella. As Russia’s threatening references to its nuclear capabilities have become more explicit, there are signs that NATO’s Nuclear Planning Group is returning to strategic discussion of a kind it has not had for many years. NATO nuclear exercises are a regular feature of the Alliance’s activities and discussion of nuclear issues has become less abstract and more operational in tone in recent years. What if anything should the United States expect in return for this extended deterrence cooperation? Posing the question in that manner, as seems to be President Trump’s approach, assumes that extended nuclear deterrence is, or should be a direct and distinct bargain between the United States and its allies. But history shows that this would be very misleading. Nuclear weapons cooperation has been a crucial factor in reinforcing institutional commitment within alliances and achieving consensus on strategic priorities; it promotes alliance cohesion at times when that cohesion is potentially threatened by perceptions of differing strategic priorities among allies. Rather than a bargain in its own right, nuclear weapons cooperation creates the basis of trust and commitment upon which allies are then able to negotiate–and strike–the necessary deals on burden-sharing and alliance strategy. All the iconic steps by which NATO developed into a genuinely ‘nuclear alliance’–including the reliance on nuclear weapons after the failure of the 1952 Lisbon Summit goals, the development of nuclear sharing in the late 1950s, the creation of the NPG in 1966, and the dual-track decision of 1979–were ultimately taken to promote broader alliance bargains about relative costs and benefits embedded in NATO strategy and posture. In most of these cases, the need for a new bargain arose because of allies’ concerns about U.S. policies, rather than a changing threat from the adversary. The creation of the U.S.-Japan and U.S.-ROK extended deterrence dialogue forums in 2010-11 also resulted from broader concerns that Washington, DC might be backtracking from the nuclear dimension of its alliance commitments in East Asia, with potentially adverse implications for broader U.S. security assurances. In Cold War Europe, and more recently in East Asia, consultation on nuclear strategy and posture has been an important means for the United States to influence the choices of its non-nuclear allies. American interests in this regard are far broader than the objective of avoiding further proliferation among allies. In the past, Washington, DC has been able to gain increased emphasis on conventional forces in NATO defence planning when negotiating the new role of nuclear weapons under flexible response, and alleviated allied concerns about concessions to the Soviet Union by pushing for NATO nuclear force modernization. As U.S. relative strategic weight continues to decline, and as Washington, DC confronts fiscal pressures to curtail defence spending while tensions mount in Europe and Asia, President-elect Trump is right to highlight the need for greater military burden-sharing with allies. Reducing the role and prominence of U.S. nuclear weapons in its alliances, however, would remove a major avenue for U.S. influence. In the Trump era, the success of future alliance strategy will almost certainly have to rest on greater contributions by U.S. allies. But simply demanding–or expecting–greater contributions is not a strategy itself. Like many Presidents before him, Trump will find that the way Washington, DC approaches extended nuclear deterrence is the real ‘Art of the Deal’ in U.S. alliances. Stephan Frühling is Associate Professor and Associate Dean (Education) in the College of Asia and the Pacific at the Australian National University. Andrew O’Neil is Professor of Political Science and Dean (Research) in the Griffith Business School at Griffith University. 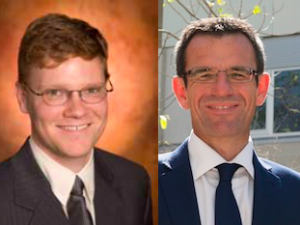 They are the authors of “Nuclear weapons, the United States and alliances in Europe and Asia: Toward an institutional perspective”, Contemporary Security Policy, 38, forthcoming. It is available here.